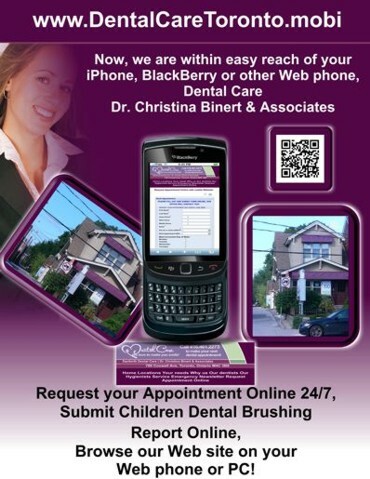 Dentistry Dentists Dental - Mobile Web site accessible by Smartphones. Listing Dental Clinics with mobile websites! DentistryDentistsDental.mobi is a Mobile Internet Guide of Dental Clinics interested in reaching and communicating with their patients and potential patients via mobile communication; BlackBerry, iPhones and other Internet enabled phones! Services are also available to other Medical Professionals; Walk In Clinics, Family Doctors, Chiropractors, Optometrists and others. Are you a Dentist, Orthodontists, Periodontists or Oral Surgeon & Maxillofacial Surgeon? List your profession on our relevant Dental Mobile Web site, Stay Open 24/7 and make it easy for public to communicate with you, using their mobile devices 24/7. View the Featured Mobile Dental Web sites listed below! If you have a Smartphone, there is a dentist in Toronto with mobile Web site for Smartphones and the patients' convenience. Uniqueness of all Mobile Websites is with embedded eForms to allow easy patient-to-dentist communication 24/7. eForms are Secure Database Forms Online. Dr. Muyal and Associates Dental Care located on Dundas Street West at Bloor Street in Toronto www.DrMuyalDentistry.mobi is mobile Dental Web site for Web phones. Nicholas Kemp Dentistry, Downtown Toronto is a Cosmetic Dentistry located on subway at Bay and Bloor Street West in Toronto. Click to the dentistry Web site www.NicholasKempDentistry.mobi for all Web phones and PCs. View the video online. Dental Care Group on Coxwell Avenue at Danforth Ave is a Family and General Dentistry with special care for children. View their mobile Web site www.DentalCareToronto.mobi. Request Appointment Online 24/7 and children love the special Dental Brushing Report Online. SmileWork with Dr. Paul Mirkopoulos is Family Dental Centre also with care for children. It is located in Agincourt, Scarborough, now also designated also as North East Toronto. Visit Dental Centre's mobile Website www.SmileWorkDental.mobi . Request your Appointment Online 24/7 and Submit Secure Health Questionnaire Online for teenagers and adults. Residents of Thornhill in Ontario can Request Dental Appointments and Submit their Health Form Online 24/4 with a Dental Care at Yonge and Clark Street. Dr. Muyal & Associates www.ThorhillDental.mobi is mobile Dental Web site for convenience of Thornhill patients.